Walk into my classroom in early August, and you’ll see students with their heads together, excitedly discussing their marble boat designs. There is chaos, but students are moving about the room purposefully between their desks, seeking out my feedback, and to the counters to test their models. Three years ago, our school district adopted the Next Generation Science Standards, and we shifted not only the what we taught, but also how we approached our lessons. Previously, we addressed engineering as a one-shot challenge, where students were given a creation prompt, a time limit, and some materials. Typically I used a mystery building challenge, such as: “build the tallest tower you can from the materials in this bag in 20 minutes.” I knew that there was more to engineering than these quick building competitions, but I had no idea how to actually implement that into my classroom. When I heard about engineering-related projects other teachers were doing, they used coding, 3D printers, and robotics; even though I’m a techy teacher, this intimidated me. Last spring, my students and I participated in an engineering design field trial through the Lawrence Hall of Science where students were presented with a design challenge, had design constraints, and created and tested prototype models. After this experience, I felt more comfortable facilitating engineering into my science class. Engineering can easily be implemented by providing students with a problem or challenge, giving them design constraints (certain materials, budget, and/or size or appearance guidelines), and designating time for students to design, build, test, and redesign. So far this school year, we have done two different engineering design labs. The marble boat engineering lab fit in less than our 100 minute block period, and was highly engaging for my students. I have done a similar activity with my students in the past as a one-shot design competition using pennies–this time I didn’t have enough pennies, so we switched to marbles. 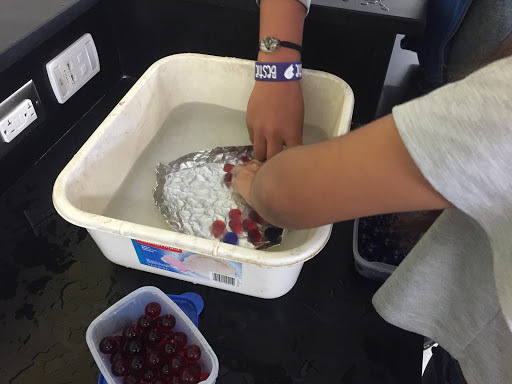 To prepare our lab stations, I set up bins and buckets with water and containers of marbles. After I introduced students to the lab and expectations (Mix 7th graders and water, some guidelines are necessary! ), I asked them work in pairs to draw their first design in the “design & build” section. Once they showed me their drawing, I gave them a piece square of aluminum foil–any size works, as long as you stay consistent within the class period. Students went to test their design, and recorded how many marbles their boat held. When pairs returned to their seats, they filled out the “test” and “reflect” sections for their first design, and moved on to their next “design & build.” This design and build, test, and reflect process was repeated three times. Afterward, students completed their analysis questions to justify their most successful design. Once we finished the lab, we had a lively class discussion on what skills they used while completing the engineering design process. Eventually and with guidance, students came up with the following skills: ask questions, research, imagine solutions, build and test a model, and revise model. We discussed how engineering is not linear, and requires students to constantly think and reflect on what is working and what can be improved. One great thing about this lab is that I brought it to our moderate/severe special education class on my prep period. I was able to complete the lab in small groups with this group of students plus a few instructional aides. With the more verbal students in the class, we were able to have conversations about making changes to designs and what worked and what didn’t. For others, the act of counting marbles together was a valuable skill. After the marble boat engineering lab, I introduced my students to a larger project, the paper airplane engineering lab. This project took a week, two 100-minute block periods plus a Friday minimum day. 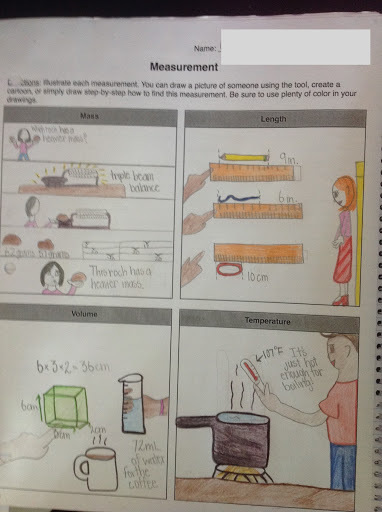 In previous years, I’ve used a variation of this lab to teach the scientific method, independent and dependent variables, and data collection. My science team and I modified this lab to focus on engineering. Just like the marble boats, students designed, built, tested, and reflected on three different paper airplane models. Their goal was to create a paper airplane that flew both straight and far. To set up this lab for testing outside, I recruited students to draw landing strips, 1 meter wide and 20 meters long, in chalk on the concrete. With meter sticks, we marked off each meter along the landing strip. 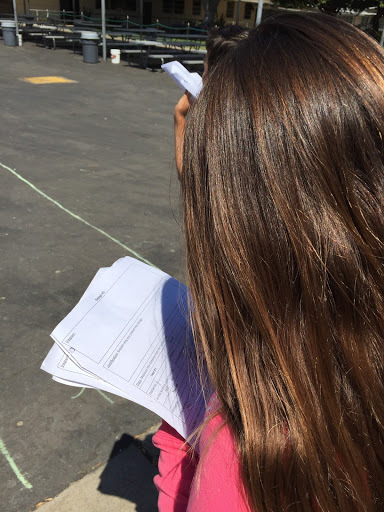 When we went outside to test paper airplanes, students noted if their paper airplane flew straight and landed in the landing zone, and estimated how far their paper airplane went, down to the half meter (quarter meter for students who felt comfortable with that). 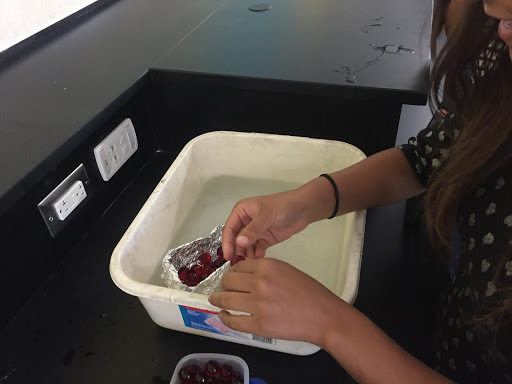 Even though this is less accurate, we prioritized focusing on engineering practices over measurement skills–we will spiral back to measurement multiple times this school year, and exact measurements were not detrimental to our lab. 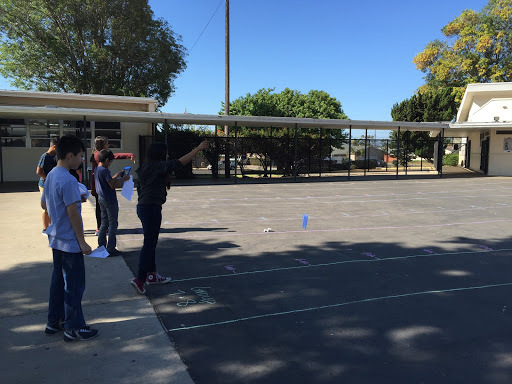 For students who are ready, finding exact measurements and calculating the average distance would have been a logical extension. 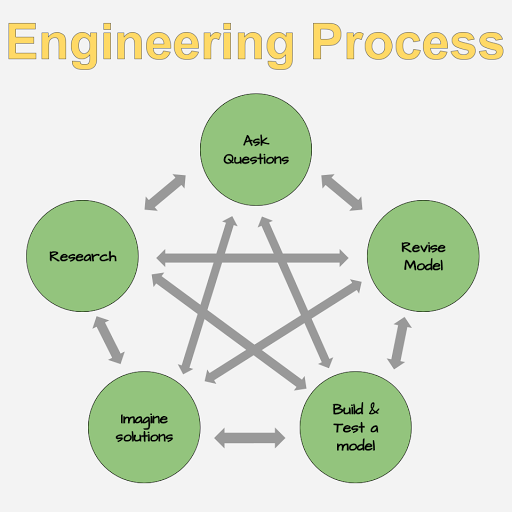 This school year, as my students and I get more comfortable with the engineering design process, we will be able to expand the scope of our projects. We have a good foundation for what engineering looks like on a small scale. Our next steps are to bring in an engineer as a guest speaker to talk about their career, and continue with more engineering projects that fit in with our curriculum. Technology is an incredible tool the enhance and extend student learning. As we move more and more towards one-to-one technology classrooms, we need to keep what is best for students in the forefront of our minds. Sometimes, an analog model works best for student learning, and we must set aside the devices for a while. In my seventh grade science classroom, I do just that with our interactive science notebooks. I follow a fairly strict interactive notebook format, where the right side page is the input and the left side page is the output. 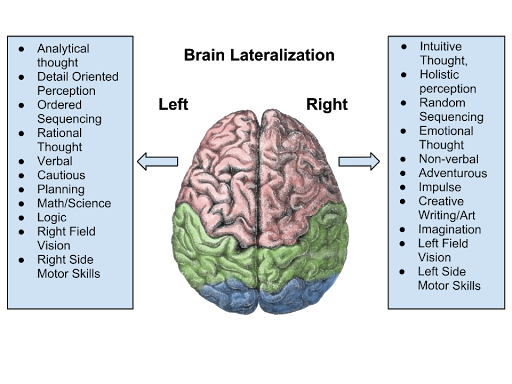 This is based on brain lateralization, where the left side of the brain focuses on being analytical, and the right side of the brain focuses on creativity (remember, each side of our brain controls the opposite side of the body). We always do the right side, then the left side; this takes a while for students to get the hang of, but eventually it becomes routine. We set up our notebooks together in the first two weeks of school, once schedules are settled and students are comfortable in my class. I require students to have a single subject 8.5” x 11” or 9” x 11” notebook, which is enough for our entire school year. On notebook set-up day, we number each page front and back starting with the first right side page as page one. It is extremely important that students number their pages correctly–this saves a lot of trouble and stress for both the student and the teacher later on. Then, I provide students with handouts and a list of what will go in their notebook. This includes general information about our class, bathroom passes (I give them six per semester, and I do not offer extra credit for leftover bathroom passes), templates for writing claim-evidence-reasoning in science, and a summary of notebook expectations. 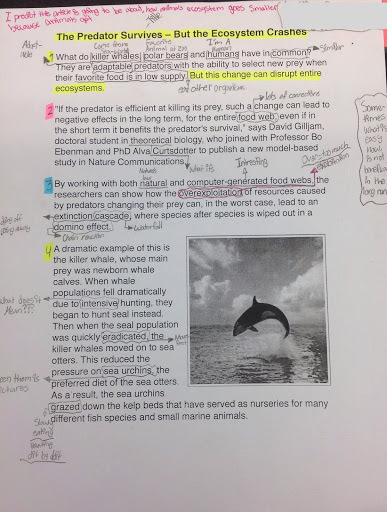 I have created some interactive science notebook templates. Feel free to customize to meet your needs. At the end of each unit, students complete their unit title page, self-check, individual reflection, and parent reflection. This allows them to identify their best work, areas of growth, and progress they’d like to make. We check notebooks in class with trade-and-grade, which saves me time. I’m always walking around to double check grading, and I randomly spot check notebooks in each class. In our science class, we are on a 100 minute block schedule. I almost always follow the same class format: warm-up, right side input, left side output, activity, closure. The routine helps students know exactly what to expect each day, and there is plenty of room for creativity and excitement. Our right side pages are input, and can be information from direct instruction, short flipped video lessons completed for homework, videos (Bill Nye and Magic School Bus are our favorites), or station work. These are done in Cornell Note format. 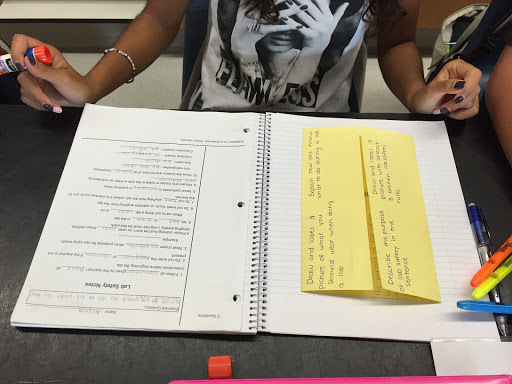 I provide my students with cloze Cornell Notes to make the input part as quick as possible. Slowly throughout the year, as they learn to write faster and more efficiently, I have them take on more and more of the note-taking process. After we’ve completed the right side together, I provide instructions for students to complete the left side of their notebook. This is always a creative activity that includes plenty of color and open-ended prompts. Activities include: quickwrites and quickdraws, creating cartoons, T-charts and Venn diagrams, and labeled diagrams. With the exception of video notes or graphic organizer, the right side page typically takes no more than ten to fifteen minutes. We usually allow for twenty to thirty minutes for the left side page, and occasionally longer for a more detailed assignment. The entire right-left cycle can be completed in under an hour, including a warm-up and organizing notebooks for the day. This leaves the last hour for the activity, which may be a lab, game, stations work, or project, that directly implements what was learned in the right-left cycle (or a few right-left cycles). With labs in science, it is easy to adjust lab handouts into a right (procedures and pre-work) and left (data and analysis) format. My students absolutely love their science notebooks, and always smile at the end of the year when they flip back through to see how much they’ve grown throughout the year. This year, I am lucky that my whole department is on board with interactive notebooks in science! Context: I teach 7th grade science, and history is my least favorite subject. My background knowledge is lacking in both US and world history, unless it directly pertains to science. I had incredible history teachers in middle school, and sub-par history teachers in high school. In so many ways, the teacher makes the subject come alive! Last week, I was chatting with one of our amazing US History teachers, Daniel Garcia. I asked him what they were teaching. Turns out, they were learning about Hamilton v Jefferson. Did you just say…Hamilton?! Ok, I’m interested. Why? Because Hamilton, duh. Mr. Garcia going over the day’s objective. They were analyzing primary and secondary source documents from both Jefferson and Hamilton, and discussing the merits and faults. I ended up in Mr. Garcia’s class for most of period 2 on Tuesday, and the end of period 4 and beginning of period 6 on Thursday. On Tuesday, they listened to the intro song, Alexander Hamilton, and analyzed Hamilton’s background (tangent conversation, what do you notice about the actors?). On Thursday, they listened to Cabinet Battle #1 and Cabinet Battle #2. If the kids weren’t interested in Hamilton after Tuesday, they were begging for more after these 2 songs! At one point during 4th period, I usurped power from Mr. Garcia to ask the kids “How do you think the Jefferson v Hamilton battle would have been different if it were via social media? And what are their hashtags?” That got them exciting and talking! Ok, so Hamilton is exciting and popular. Awesome. Wow. But so what? I’ve seen many of our usually disengaged students perk up with Hamilton. They love the lyrics, the hip hop, the angst, and that this is something cool outside of school. I stood in line outside Mr. Garcia’s class (ok, so really, it started as a game of “how long can I blend in before he notices”) and had a great conversation about women’s rights and the 2016 election with some of my former students. For other students, using music to learn instantly makes learning come alive. On Friday, I did a circle with my 0 period AVID 8th graders to discuss using music in class. I started the period with 3 warm-up questions, (1) Make a hashtag for Jefferson, (2) Make a hashtag for Hamilton, and (3) Were you in the room where it happened? #3 got them super confused and curious. Only one student in my class understood the reference, and was cracking up. Everyone else kept asking “Ms. V, what does #3 mean?” I asked them to get in their circle, and before I threw out the question, they were already in a heated debate about Hamilton v Jefferson. For 15 minutes, they continued an intense conversation about the two and their ideas, using evidence from what they learned in history. Mind you, this was 7:30am. Finally, the conversation died down, and we moved on to discuss how Hamilton and other music fuels their interest in a topic. Overall, they agreed that authentic music experiences help them learn (such as Hamilton, Flocabulary, etc.). For me, music and musicals are an instant hook. Cats was my broadway musical gateway drug in 4th grade. My dad and I read Old Possum’s Book of Practical Cats together when I was on a poetry kick, then watched the musical. I moved on to Les Mis, Hairspray, and Rent. For all of these, I took time to research the issues and people behind the musicals. I love that my students have found something relevant to ignite their passion for learning!